The real Italian heart beats in the peasants. Somewhat our royals have been always underwhelming. Take our former Savoy kings, for example. 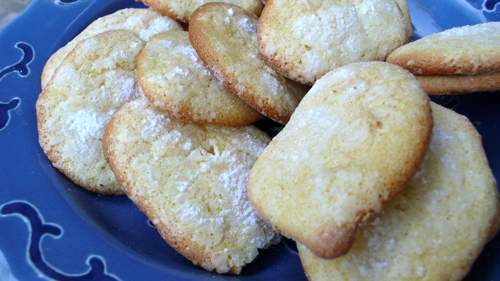 It is said that ladyfingers – savoiardi in Italian – have been created at the court of Amadeus VI duke of Savoy in honor of Charles V king of France. As the story goes, the head baker of Savoy was asked to invent something memorable to impress the king during a very rare visit to the Duchy. Imagine: the medieval king is used to lavish banquets where he is served dishes like the tourte parmerienne, a pastry dish made to look like a castle with chicken-drumstick turrets coated with gold leaf. His head chef, Guillaume Tirel is considered one of the first truly “professional” master chefs in European history. Then he goes to visit his brother-in-law in Savoy and he is offered sponge cookies. Wow. I am not sure the story it’s true, but we should have gotten read of them a few hundred years earlier. I mean, the would-be-kings Dukes. Luckily we kept the cookies and used them to invent tiramisu. They are also lovely with gelato, warm custard, ricotta or simply dunked in good sweet wine like a Vinsanto o Moscato. And very, very easy to make. Preheat oven at 150 °C (300 ° F). Line a large baking sheet with buttered parchment paper. If you don’t butter the parchment paper you will have to eat it as it’s hardly possible to remove it from the cookies after baking. Whisk egg whites until firm. Cream the sugar and egg yolks, add lemon zest, vanilla extract, flour and milk or yogurt and keep whisking to obtain a very thick batter. Fold in egg whites using a metal spoon. Make sure to incorporate them lightly, with circular upward movements so to obtain an airy mixture that will not deflate while cooking. At this point, using a pastry bag, you should pipe the batter into 10 cm (4 inch) long strips on the baking sheet. I hate pastry bags, so I use a soup spoon making sure to keep the strips at least 3 cm (1 inch) apart. One spoon of batter is enough for one ladyfinger. Now sprinkle half of the sugar mixture onto the strips and wait for 5 mins before sprinkling the rest. This makes that pretty craquelè coating. Bake for 20 min or until golden around the sides. What gorgeous little treats–they look perfect on that blue plate. I’m a fan of anything with lemon zest! I wonder what would happen if the cookies were just baked on a buttered cookie sheet, without the parchment paper (this is something I never have in the house)? I enjoyed your description of tourte parmerienne!!! Hi Jann, I never butter parchment paper but these cookies are particularly sticky. I guess you should be safe if you butter generously your cookie sheet, but may be bake a small batch first and see what happens. I must say the homemade version is quite a lot better than the bought one! What a wonderful story, and a delicious recipe! I have no doubt they are much better than any thing bought! I am deep into Cheese making right now. We have started a world wide project called Cheesepalooza and I have made my own mascarpone more than a few times, now. Still working to perfect it. Just made Halloumi today and am munching on a bite made last week! YUMMY! I will definitely make your biscuits with my homemade cheese – now have to make the coffee liqueur!